There isn’t a better way to introduce campers to the world of robotics and programming. Club Scikidz provides open-ended opportunities to build and instruct how robots will look and function. Teachers know that hands-on learning engages students at every level, sparks creativity, develops critical thinking skills, ignites career possibilities — and is just plain fun! 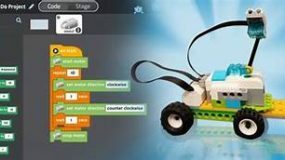 LEGO® Education WeDo 2.0 brings to life 280 building elements that motivate students to collaborate, build, problem-solve, and explore, all while deepening their STEAM learning and developing 21st-century skills. The combination of physical LEGO® bricks, standards-aligned activities, and intuitive block-based coding environment means that interactive, creative learning is easier than ever to achieve – students can see their builds in action and test and refine their problem-solving skills! 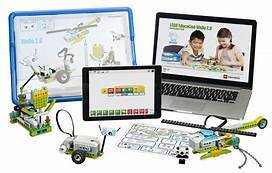 The LEGO Education WeDo 2.0 Core Set, which includes 280 bricks, as well as sensors and motors, offers endless possibilities for making abstract concepts concrete by using tangible elements campers can manipulate with their hands. This is a camp your don’t want your young engineer to miss. What fun!